In Web Help Desk, ticket and asset reports can show information as a bar or pie chart, in addition to a table. To configure a bar or pie chart, you must specify the Category and Chart Metric options. Understanding these options helps you create reports that display the information you need. Each bar or slice represents a group of tickets or assets. The Category is used to group the tickets or assets. (It is the element that each bar or slice represents.) To select a Category, choose the element you want to compare. 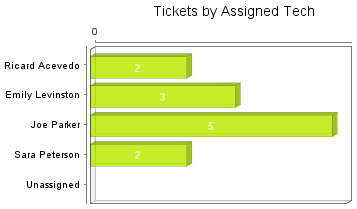 In this bar chart, tickets are grouped by assigned tech. Each bar represents a tech. The Category is Assigned Tech. 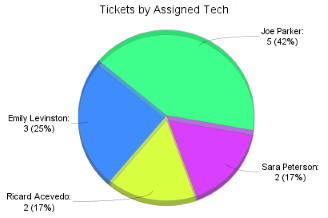 In this pie chart, tickets are grouped by request type. Each slice represents a request type. The Category is Request Type. For bar charts, you can also choose a Bar Stack Category. This setting can be used to subdivide the tickets or assets within each bar. In the example below, the Bar Category is Assigned Tech and the Bar Stack Category is Priority. 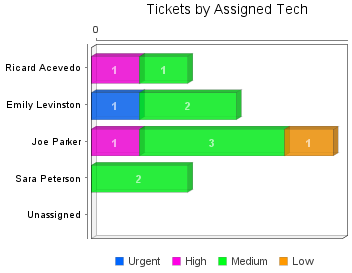 Now you can see how many tickets are assigned to each tech, and whether any tech has a large number of Urgent or High priority tickets. The Chart Metric determines the size of the bars or slices. In many cases, it is the total number of tickets or assets in each group. For ticket reports, it can also be a time measurement, such as the open time or work time. Which techs closed the most tickets last month? Which assets are associated with the most tickets? Which tech has the shortest average first response time? Which location has the most open tickets?